A limestone cliff located in the Ain Trez Village, offering pleasant views and beautiful sights. Mainly some technical climbing. South-West facing cliff, it is best to climb early mornings or late afternoons especially in Summer. A 60m rope is enough for all the routes. 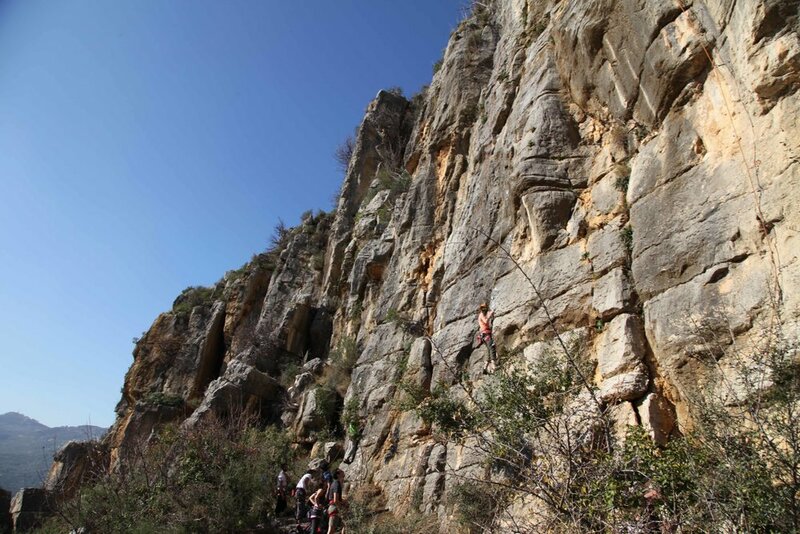 This crag was developed by the LCA in collaboration with Julien Pierson, Edgard Kazzi, Rami Bou Chdid and Elie Diab. From Aley, drive towards the upper part of the city direction "Bkhechtay, Chartoun, Richmaya". Landmark: the amusement park to the right of the road. Ain Trez is located straight after Chartoun 10km away from Aley. Arriving to Ain Trez, Locate on the right a large stone convent. Take a right on the road leading to the convent. The road winds down. Park on the last bend before the concrete houses located a hundred meters away. Walk on the path towards the left that leads to the top of the cliff edge. Follow the path from the parking lot to the East. After 5 minutes, you will reach a stone treadmill. After it, head down a few meters and continue walking East along a stone wall which supports an olive terrace, about 200m to a small pile of stones. At the pile of stones follow the steep path down towards the valley. after about 20 meters you can either go right towards Secteur Illusion, or left towards Secteur Princess Leila and Secteur Roméo and Juliette.